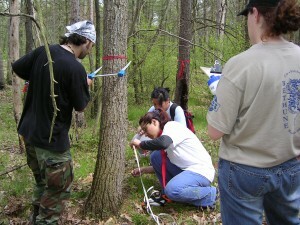 The students at left are measuring trees in Pinery Provincial Park, Ontario. We began studying the impact of herbivory by white-tailed deer in Pinery and other parks in the Carolinian zone of southwestern Ontarion in 1991. This led to research into the spread of introduced plant species, the success of habitat management to restore rare plant species and ecosystems, such as black oak savanna, and an interest in the politics of forest conservation in Ontario. As a result of this research experience, I was invited to sit on the provincial human-wildlife conflict advisory group. This work relates to the science-policy interface. We are currently doing research on the soil seed bank composition of forests across urban to rural gradients, which is applied ecology research.